Be the first to share your favorite memory, photo or story of MR. ERNNIE. This memorial page is dedicated for family, friends and future generations to celebrate the life of their loved one. 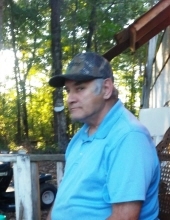 Mr. Ernnie Smith, a resident of Camp Hill, Alabama, passed away Saturday, February 09, 2019, at the age of 70. Funeral services will be Tuesday February 12, 2019 at 2:00PM at Saugahatchee Assembly of God Church with Rev. Butch Cousin and Rev. Joe Richardson officiating. Burial will follow in Saugahatchee Assembly of God Cemetery, Jeffcoat Funeral Home directing. Mr. Smith is survived by his children, Crystal Pape (Chad), Jeff Tate (Cindy), Chris Tate (Tanner) and Wade Tate; grandchildren, Skyler, Ciera, Savannah, Lucas, Bryan, Justin, Jeffery, Katelyn, Stephanie, Alisha, Allison, Jeremy, Jacob, Rusty and Briar; siblings, Dean Mann; sister in law, Lou Ann Tatum and several nieces and nephews who will miss him dearly. He is preceded in death by his wife, Barbara Smith; son, Steve Tate; daughter, Angie Gates; nephew, Russell Mann; brother, Willie Tatum and sister, Martha Futral. The family will receive friends Tuesday, February 12, from 1:00PM until service time at Saugahatchee Assembly of God. To send flowers or a remembrance gift to the family of MR. ERNNIE SMITH, please visit our Tribute Store. "Email Address" would like to share the life celebration of MR. ERNNIE SMITH. Click on the "link" to go to share a favorite memory or leave a condolence message for the family.